At my Guild meeting we had a fascinating talk about the Stamford Bridge Tapestries. Most people have heard about 1066 and the Battle of Hastings, all gloriously illustrated on the Bayeux Tapestries. 1066 was quite a tumultuous year here in Britain with three English kings and two major battles. I remember reading the Simon Schama book on the history of Britain, I was on the train going to work when I was reading about 1066, it was so exciting I didn’t want the train to get to Leeds!! The Battle of Stamford Bridge here in Yorkshire happened just three weeks before Hastings, without it the outcome in Hastings would probably have been very different. The troops had to march from London up to Yorkshire (over 200 miles) there was then a very bloody battle with the Vikings which resulted in the Norwegians leaving in less than 30 boats, having arrived in over 300! The English troops rested in York for a couple of days before they heard France had invaded in the South, so the battle weary troops had to march back down to the south coast to fight another battle, and the rest is history, as they say! As the battle of Stamford Bridge was really just as important as Hastings, someone in the village had the idea of making a tapestry to depict the story, along the lines of the Bayeux Tapestry. A team got together, they started about five years ago and have almost completed the twelve panels. They are amazing to see, each about 120cm across with lots of detail in the pictures. The team of embroiderers tended to specialise in certain bits, one lady was good at dogs, another horses etc, they tried to ensure characters were recognisable from one panel to the next by the colour of their clothing. 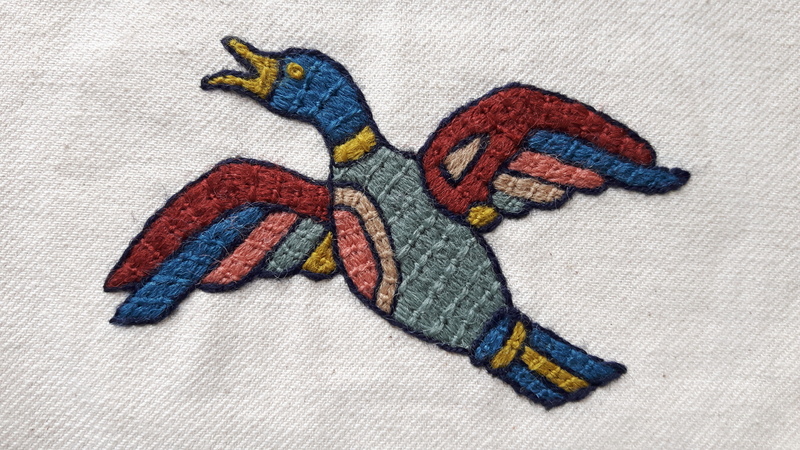 They used Bayeux stitch mainly which gives good coverage whilst being very economical with the thread. It was also interesting to hear how they transferred the outlines for the embroidery. They didn’t want to risk using supposedly disappearing pens on the front, so they traced a reversed outline onto calico which was the backing for the embroidery, they could then stitch a fine running stitch through both layers along all the lines, giving a clear outline on the front. Ingenious I thought!! It is hoped the tapestry will be on permanent display in Stamford within the next few months, it will be worth a visit if you’re in the area. Apologies for the quality of my photos, they were taken on my mobile, there’s lots more photos on Skipton Embroiderer’s Guild website if you follow the link. 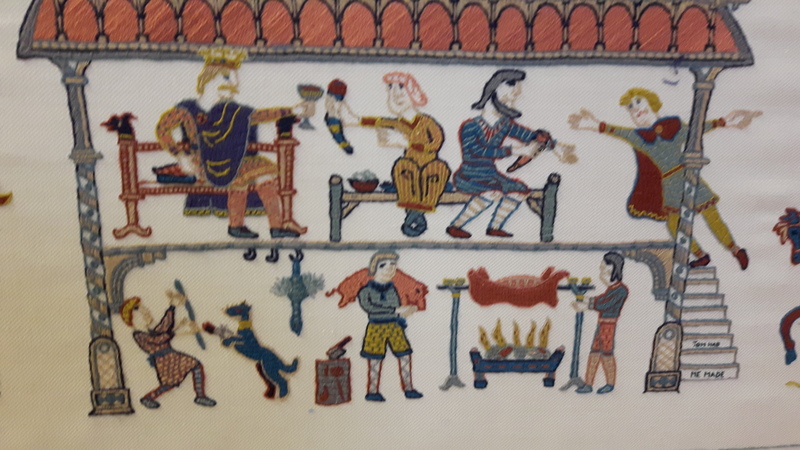 This entry was posted in embroidery and tagged 1066, embroidery, Stamford Bridge Tapestry. Bookmark the permalink. 15 Responses to Tapestries and Vikings! Another post that WordPress won’t let me ‘like’… it’s so frustrating. Anyway… what an amazing piece of work. I think I might have to have a trip to see it, although it’s quite a long way it’s not as far as Bayeux and I’ve been there twice to see the tapestry. I’ve never seen the Bayeux tapestry, it’s on my to do list ! It’s worth a visit… especially for those of us who sew and can understand the scale of the work that went into it. Endorsing what the snail says, I have seen it once and well worth it. Wow! You have some very talented ladies up there. that’s a marvellous piece of embroidery! What a brilliant piece of work. We should all be proud of our history and ensure that new generations understand it. This tapestry will help with that. The Ladies are so talented. I saw part of it last year at The British wool show in York, and had a nice hat to the lady working on it. It’s amazing. Just to add that Stamford bridge is a very pretty place and nothing to do with Chelsea Football club. Amazing idea – just been teaching about Hastings in class today – and you are right, Stamford bridge was mentioned more as a by-line in the story. What a great idea, and this piece looks brilliant. It’s good to see our history being told in this medium. The tapestry looks amazing and is so redolent of the Bayeux. As a history lover and a stitcher, I’m grateful for you sharing this, Margaret. Your pics are very clear! This makes me think of the Great Tapestry of Scotland, from a few years ago. Such inspired creations, and beautifully wrought!